In the act of performance, French trio Zoor are looking for unpredictable events. We tend to think of the unknown as something remote, distant and alien. In fact, it may be just around the corner. Into the first minutes of Volumes a+b, the debut album by French trio Zoor for example, nothing seems out of the ordinary: Antonin Gerbal is pounding his drums as if caught in a psychedelic dream of The Velvet Underground's "Heroin", Jean-Sébastien Mariage is gradually expanding his guitar lines from brittle, solitary tones via inquisitive melodies into ferocious tremolos, while saxophonist Bertrand Denzler shows himself capable of repeating the same note for minutes on end without ever awarding it the same emotional impact twice. Anyone who has followed the paths of these musicians will recognise their personal capacities and modes of expression. And yet, the impression of familiarity quickly gives way to one of astonishment and wonder: Similar to a formations like Hubbub, which features Mariage and Denzler, the sound of Zoor, too, is dense and compact, coalescing into a unified sheet of mesmerising noise rather than a multitude of polydirectional voices. At the same time, it is raw and nervous, constantly on the verge of an explosion which won't come, hovering exactly over the border between the becoming and defined without ever choosing sides. Which is exactly the way the trio wants it. By carefully choosing and constantly questioning their actions, they have arrived at a fascinatingly stable imbalance, where, as Antonin Gerbal aptly puts it in this interview, 'only time will tell what can happen'. Which puts a new spin on traditional concepts of progress and development: We tend to think of the unknown as a a barrier, an impediment, as an obstacle to be overcome. To Zoor, however, it is the only way of keeping the miracle of playing together alive. I'm curious about the beginning of the band. How did Zoor evolve out of Peeping Tom and Hubbub? What were some of the factors that brought the band together - and were there any kind of formulated ideas about your approach? Bertrand Denzler / Actually, I'm not sure that Zoor did evolve out of these two groups. Jean-Sébastien and I have been playing together in Hubbub since 1999. 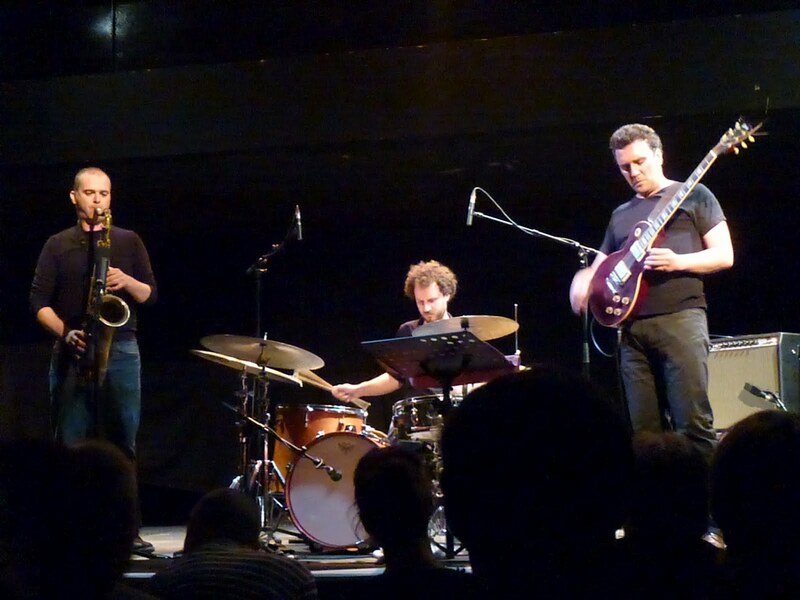 But we already worked together before that in other projects and have continued to do so since then - as a duo, with Chamaeleo Vulgaris, in a quartet with Xavier Charles and Matthieu Werchowski ... The first time I heard Antonin was with Peeping Tom and, as I enjoyed his playing a lot, I asked him to join us. But I don’t think that there is a direct musical connection between Peeping Tom and Zoor. These are quite different projects. Antonin Gerbal / I remember that first meeting with Bertrand, it took place at a Peeping Tom concert in a festival he organised with Marc Baron. After the concert we talked about many things in general but also about our approach to music and especially about the (non)meaning of the word jazz in relation with non-idiomatic improvisation. I remember he seemed surprised to hear the music we played that day: close to traditional tunes but at the same time very far away from it them as well, because of the "bricolage" we like to inflict on jazz standards. At this time, I was pretty familiar with his work through Hubbub and Trio Swari and I really enjoyed what he developed with these projects. After that day, we started to meet each other quite regularly for speaking with passion about a lot of different subjects. One day, he proposed to try and work in a trio with Jean-Sébastien. Bertrand Denzler / Normally, the bands I play with start because some musicians want to play together in the way they “usually” do. Most of the time, if there is a conscious musical idea, we wouldn’t talk too much about it before playing together. In the case of Zoor, I had an idea for a trio with saxophone, drums and electric guitar, which would play “improvised music” (whatever this means, but I could hear it in my head) but without “extended techniques”. Jean-Sébastien Mariage / The main proposition from Bertrand was to play the same music we used to, not just without extended techniques, but also without objects, except the regular ones, such as picks for example. Bertrand Denzler / The idea was to use the “traditional” sound of the instruments instead - or, to be more precise, what each of us considers to be the “traditional” sound of his own instrument. And I asked Jean-Sébastien and Antonin because I liked (what I thought was) their “traditional” sound. I also had other ideas about the music I wanted to play and I did explain these ideas as clearly as I could. We rehearsed several times, trying to play this music, which was not “written” in a conventional sense. But after a while, we noticed that we didn’t manage to play this music like we wanted to and that we had to find another way of playing together. So we decided to try to forget this music as far as we could, each of us keeping what he wanted from what had been said and what had happened before. At this point, we started to develop collectively the music you can hear on the CD, which is still evolving I think. Antonin Gerbal / The main idea or hypothesis was to (non)develop an infinite slow pulsation which is and goes nowhere - to the limit of still being a pulsation, to the point of being a kind of (non)pulsation. It was very open and fertile in our minds and it created a strange sound landscape where all is static but in movement. I wanted to give shape to this idea. For a few years now, in various ways, we are focusing on this imaginary ground. From your press description, I understood that there are two aspects to your music: That it happened very naturally and that it feels completely fresh to you. What is this music that you don't know yet? How, as experienced performers, are you feeling about and dealing with a situation where you can't just fall back on proven recipes? Jean-Sébastien Mariage / We don’t know how this music works, we discover it only when we play. There is no recipe, or at least we don’t know what it is. I do know what sound I am playing at any given moment, but I don’t know how I will continue playing it. Then either Bertrand and/or Antonin changes something and it modifies what I do. Then my sound is new and I come back to the beginning: how should I continue that sound? Betrand Denzler / To me, it’s not about the absence of proven recipes so much. It’s more about playing music without being sure of what will come out, what will happen. But the goal is not to “create something new”. It’s more about allowing what we call “our music” to live its own life. I think we try to play the same music each time – Zoor’s music – but knowing that it will be different each time as we have to keep this sound alive in a different situation, objectively and subjectively, individually and collectively. We know the sound of the band. But we don’t know in advance how we can manage to keep this sound alive: this happens in real time, with all parameters that one can imagine. I think that one of the objectives is to transform time into space, a space that we generate but which includes us as well. Instead of thinking of the “musical object” that exists in retrospect, we work to create a space and structure it from the inside in order to keep it alive. Antonin Gerbal / I try to have a good technical control over my movements - finding a place I already know - just to be able to listen to what unknown could happen. There are specific movements for specific musics and habits are important to me. Listening to things expresses a desire for duration: it can go anywhere, it never started and it will never end; all there is is an an infinite and relative pulsation. This fresh thing you mention, or whatever you call it, is just a pure sound intensity which is neither outside of the experience of repetition nor only inside of it. There's something more, not magic to me, but impossible to describe empirically: it's a "miracle", an unpredictable event. How would you characterise your co-members in the formation and what makes them fruitful to play with? Bertrand Denzler / As I said, I like their sound very much. But I also like their approach, their capacity to be completely focused on the music, taking it very seriously, as if it were a question of life and death to keep this sound alive. I like their way of musical thinking. This is what I enjoy most in music: hearing someone thinking musically and hearing his physical presence at the same time. Somehow, it’s not about ideas, it’s about “the sound”, about real time musical thinking, about “musical surviving” and full presence with as little “representation levels” as possible. Something like that. Jean-Sébastien Mariage / As I used to play with Bertrand for nearly twenty years, our interaction is not conscious anymore. I know he is there, on the other side, and I just have to play to feel him. Playing with Antonin is really exiting because he is able to interact with us, keeping his own pulsation. I really enjoy the way he builds time, it surprises me every time. Also, I like the kind of cleverness he puts on the drums. Antonin Gerbal / Of all the guitar players I've heard, Jean-Sébastien is one of my favourites. He has opened new doors to me in terms of the kind of acoustic control you can have over the sounds with an electric guitar. Sometimes we can also have a game with loud dynamics and their undetermined durations that I like. Then with Bertrand, we played a lot together over the last few years in various contexts. He has this faculty to really think with sounds like nobody else. But the most important thing between all three is friendship and a common language and the will to question ourselves through music. The very first gig of Zoor took place at the Umlaut Festival in Paris 2011. What was it like? Jean-Sébastien Mariage / It was great! (laughs) At the beginning, for the first concerts, we played mostly minimal, with a lot of silences. Antonin Gerbal / … and during the concert, we were totally focused on what we had to do. Friends were there and we had nothing to prove. The only strange thing I can remember about this first concert is that we were playing after a band of baroque music. It was a singular situation and process. People seemed surprised to hear that music after being treated to some harpsichord before. Jean-Sébastien Mariage / The recording of "Volume a" on the album also took place under interesting circumstances at the Instants Chavirés. One of my ears was totally obstructed. So I had to listen very carefully. That gave me a weird concentration because I had to imagine, to re-build the sound. I had to use my imagination more than I usually do. How would you describe the journey from that first gig in Paris towards the finished record? Antonin Gerbal / It's impossible to answer this question because the journey you mention is both a consciousness and unconsciousness fight. You are never totally clear about the past because it follows you as a shadow and basically you don't "really" know how events happen. Jean-Sébastien Mariage / Yes - the sound of Zoor has existed a long time before we started to play it, and it will continue after us. From our first concert, the sound has been expanding continuously. That’s not a decision, it’s an observation. Bertrand Denzler / In the beginning, there were some silences, more short sounds and impacts, more “formal decisions” and more different sounds. Nowadays, I have the feeling that we are more interested in structuring a unique sound from the inside then in creating a form with different parts, which would be “analysable” from the outside. It’s something like always playing the same sound in order to keep this sound alive, not playing different sounds to create a form. Zoor is now kind of a human group, an entity in itself. Antonin Gerbal / You can merely work on your own intuitions - and a miracle! To me, the result - this CD for example - is one of the states of a chaotic process. Everything's in motion, even if you repeat the same thing, even if you are an empty point. In this empty point that I am, sounds are coming and living their own life. Conscious decisions only exist in retrospect. One of the effects of playing with a band regularly, as many improvisers have attested, is that you quickly start developing spoken or unspoken rules of engagement and specific musical forms. How is this for Zoor? Bertrand Denzler / Again: I don’t see the rules and the forms one can analyse from the outside as rules and forms. If we consider that Zoor has a specific sound, our responsibility is to keep this sound alive during the performance with our imagination. This may be an illusion. But believing in this illusion – while we play, not in normal life – changes the way we listen and play and, in the end, the music itself. Antonin Gerbal / Rules are essential to developing a way of playing, which is both open and precise. Most of the time, we talk a lot of rules as tools for testing things. But if you can't forget the rules, you can't play in a concrete situation - with an audience, in a space, a temperature etc - and the rule becomes a norm and music dies. To be able to have a good illusion of freedom and not a bad one, you need to keep secret rules to yourself, to hide things to the others and not to hide yourself behind the rules. Some people see recording improvised music as a problem. All of you, on the other hand, have repeatedly documented your work on CD. Where do you see the ongoing creative relevance of publishing albums? Bertrand Denzler / I don’t see it as a problem. More as a question. I think that it's just different from a live performance. Sometimes it's a document which allows the listener to imagine a concert in his head. Sometimes it can be even more interesting than a concert, because you hear things that you wouldn’t notice at a concert. In my opinion there is no rule. For me, recordings are a very good tool to work on my music. And listening to recordings by other musicians as well. I wouldn’t want to miss it. I don’t know if CDs are still the best way to publish these recordings, but vinyl records and/or digital releases are not unproblematic either. Jean-Sébastien Mariage / You need to remember that recording is not the same work as playing in concert. It's a sensitive point in improvisation, but I consider recording as a way of composing. After the recording, we have to chose which track to put on the CD. We have great discussions about aesthetics, which in turn gives a direction to the music. And when nobody knows your music because the project is new, a CD is the only way to promote it. Later on, it is also provides you with a good memory about a certain time. Antonin Gerbal / It's definitely not my goal in life to make as many records as possible, because I think we are at a time of music history where we have to deal with a general indigestion of documents everywhere on Internet. We should never forget that beauty is a rare thing! On the other hand, we need a new compass because many great musical experiences we can have - in improvised music or outside of it - are written on CD or LP - in all musical traditions. Recordings are also a condition for musical practices. Today, most of the time, the masters are alive through recordings - no more, no less. And we have to keep something of them but also forget other things if our will is to create music with a different meaning. So why publishing "new" music? For me it's quite simple, it's purely subjective, that's because I need it symbolically for forgetting a past work. What's up next for the band? Antonin Gerbal / We are on a musical territory wich seems quite big, singular and open to me. So we have to continue our road and go deeper and deeper into what we're doing and believing. Then, only time can tell what will happen.